An Advanced Installation also includes the component selection step. This is the same component selection that can also be accessed by clicking on Custom Installation in the welcome screen. Only this time, more detail is shown. First, all components are shown, even those that cannot be deselected. Second, a checkbox labeled "Full Detail" is now visible. When ticked, the component list will expand to show all files that the component contains and the folders into which they will be copied. 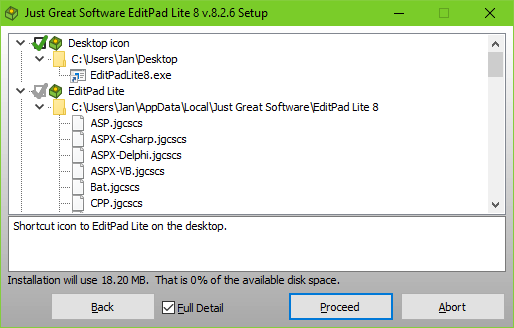 This allows advanced users to check whether the application to be installed will be using system folders as a trash can or not. When the component selection is complete, all technical questions have been asked. The setup will then continue as if the "Immediate Installation" button was clicked on the welcome screen. So next up is the license agreement.